Cork goalie Billy Morgan clears the ball during the Cork v. Meath All Ireland Senior Gaelic Football Final, 24th September 1967. 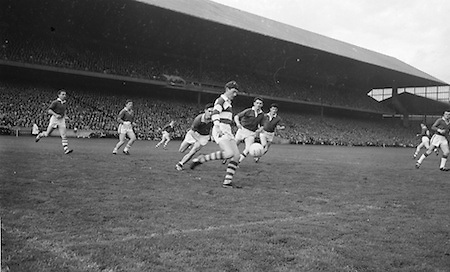 Cork goalie Billy Morgan clears the ball on the ground at the All Ireland Senior Gaelic Football Final Cork v. Meath in Croke Park on the 24th September 1967. Meath 1-9 Cork 0-9.